God says, "I will save those who love me and will protect those who acknowledge me as Lord. When they call to me, I will answer them; when they are in trouble, I will be with them. I will rescue them and honour them." Every person on this planet feels fear, sometimes more intensely than at other times. During the summer holidays a school teacher injured his back and had to wear a plaster cast from his waist up to his arms. He wondered how he would cope back in the classroom but since the cast didn’t restrict his movement at all and since it was hidden under his shirt it wasn’t noticeable. Already in the student free days before the term started he noticed that his class of all boys was going to be a special challenge. In fact, thinking of a whole year with this group of students, who had sent their previous teacher into early retirement, filled him with fear about what the year will bring and what it will do to his sanity. On the first day of the term, still with the cast under his shirt, he walked confidently into the rowdy classroom. Dodging balls of paper and airborne rulers, he opened the window as wide as possible and then busied himself with work at his desk. A strong gust of wind came through the window sending papers flying and his tie flapping. He grabbed the papers and the staple gun with a determined look on his face and with a loud ‘kerchung’ stapled the papers to the top of his desk. He had everyone’s attention. He grabbed his flapping tie and ‘kerchung’ - stapled it to his chest. Fear did the rest. That class didn’t give an ounce of trouble all term. There are many things that strike fear in our hearts. The news that a child has been hurt at school and taken by ambulance to the hospital strikes fear in parents. When you hear that your workplace is downsizing; jobs will go and you are afraid that yours will be one of them. A woman told me how much nerve it took her to leave her home. She couldn’t go near anyone wearing perfume, deodorant, aftershave etc. for fear of a severe allergic reaction. People are afraid of heights, crowded places, spiders, dying and so on. If we think too hard and too long about the world situation, we have every reason to be afraid. Terrorist attacks, earthquakes, tsunamis, street violence in our cities, identity theft shrouds us with fear. There is a chance that these things will happen right here in our own backyard. Then there are own personal fears about our health, finances, getting older, the direction of our lives in the future, the safety of those we love. Fear can be so controlling and incapacitating. A typical example of people who became obsessed with fear are the people of Israel in the Old Testament. Everything had been going so well for the Israelites. God had preserved them from the angel of death that passed over Egypt and they were able to walk free from their slave masters. They marched out boldly en route to the Promised Land. But then they came to the Red Sea. Water in every direction. How could they get across? Has Moses made a mistake? And when they looked over their shoulder they saw the dust kicked up by the Egyptian army. Here they were, caught between the Egyptian army on one side and the sea on the other, with no way out. No options. They were trapped. With fear gripping their hearts they cried out to Moses, "Did you have to bring us out here in the desert to die? Didn't we tell you before we left that this would happen? We told you to leave us alone and let us go on being slaves of the Egyptians. It would be better to be slaves there than to die here in the desert." (Exodus 14:11-12). This wouldn’t be the last time fear would cause them to distort the truth, to be ruled by doubt rather than faith. Fear had a numbing and paralysing effect – they forgot all that God had just done for them in freeing them from slavery. They forgot about God's continual presence - a cloud during the day and a flaming fire at night. All they felt was the fear of being slaughtered by the Egyptians. Remember Peter as he stepped over the side of a boat and began to walk on the water towards Jesus. Suddenly as he looked at the white capped waves, and felt the wind pulling at his clothes, he became afraid. His fear took over and he forgot that it was Jesus who had invited him to walk on the water. It went completely out of his head that Jesus was nearby and certainly wouldn’t allow anything to harm him. He had seen with his own eyes how Jesus saved people from sickness and death and could stop storms, but at that moment fear took over and what he was fearing overwhelmed him as he sank into the briny dep. Isn’t that what happens when we become afraid? We know his promise to always be our strength and support in times of trouble. We know that God loves us and is committed to us – after all didn’t he send his Son to die for us? We know that even though God never promises to eliminate all the problems in our lives, he will always look out for us and one day take us away from it all to our heavenly home. But when fear comes along, suddenly all of that goes out the window. We are anxious, depressed, terrified, worried, and panicky – you know what I mean. What was Moses' response to the fear of the Israelites? He simply stated, "Don't be afraid! You will see what the Lord will do to save you today." What was Jesus’ response to the frightened Peter? 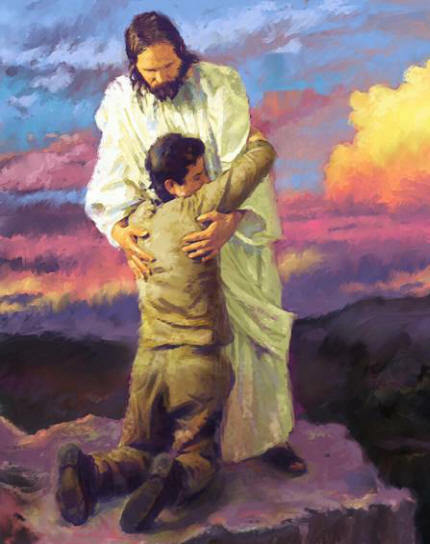 Jesus reached out and grabbed a hold of him and walked with him to the boat. He asked Peter, "Why do you have so little faith? Just trust me!" The Lord can be trusted - he is in control – he is the one who saves his people. Psalm 91 starts, "Whoever goes to the Lord for safety, whoever remains under the protection of the Almighty, can say to him. You are my defender and protector. You are my God; in you I trust" (verses 1 & 2). "You are my God; in you I trust". Those are easy words to say but ever so hard to put into practice when things are really getting us down. We find it hard to stop panicking, to be still, to listen to the Lord, to trust his promises and his love for us. Our strength, our mind, our skills are of no particular use. When Peter was drowning his own bravery and self-confidence were useless. All he could do was call out, "Lord, save me!" No deep theological reflection on Jesus’ love. No quoting of scripture verses. No great statement about Jesus being his helper and strength in times of trouble. Just a plain panic filled plea, "Lord, save me!" - a very basic and honest prayer that reflected that Jesus was the only one who could help at the moment. What can we do when fear grips our hearts? Firstly, get to know what kind of God we have. He is gracious, loving and faithful. In spite of the whining of the Israelites, God still loved them and saved them from danger. We don’t deserve it but he loves us and will always stand by us. We see how powerful his love for us is when we look at the cross and see what Jesus has done for us. Get to know God as the king and ruler of the universe. There is nothing so great or too difficult for him to handle. Parting the sea to save the Israelites, saving Daniel from the lions or Jonah from the belly of the big fish, springing Peter from jail, or saving Paul from a shipwreck were all a piece of cake for him. Helping us when we are afraid is just as easy. Secondly, know that God truly understands your pain. Because of Jesus we never cry into the emptiness of space, "Hey, you up there – do you even care?" Because of his love for us, Jesus came down to earth and gave solid historical proof that he hears our groans, and even groans with us. When we endure troubles and trials he stands beside us, like the fourth man who stood with Shadrach, Meshach and Abednego in the fiery furnace. Jesus knows what human suffering is like; he knows what it’s like to feel the icy fingers of fear grip our hearts; he felt physical pain as the lash tore at his back and nails pierced his hands. He felt emotional pain as he grieved over the hard hearts of the people of Jerusalem. He felt spiritual pain as he called from the cross, "My God, my God, why have you abandoned me?" Know that because of Jesus, God understands, truly understands our fear and pain. God says, "I will save those who love me and will protect those who acknowledge me as Lord. When they call to me, I will answer them; when they are in trouble, I will be with them. I will rescue them and honour them" (Psalm 91:14-16). The Lord is my light and my salvation; I will never be afraid. (Psalm 27:1,2). God is our shelter and strength, always ready to help in times of trouble. So we will not be afraid… (Psalm 45:1,2). Or Jesus words of authority and power, "Don't be afraid! I am the first and the last. I am the living one! I have authority over death and the world of the dead." (Revelation 1:17). Be assured that God keeps his promises; that he is with us, even in the worst possible situation imaginable on this earth. Fourthly, realise that there will be times when our human attempts to be bold are not sufficient. There will be times when even the texts of promise that we have learnt off by heart will do little to ease our anxiety. We may even feel that God has deserted us. So we place our lives in the hands of the Holy Spirit to help us, to forgive us for our weakness of faith, to support us while we tremble in fear and to take our sighs and groans as a prayer to God our Father (Rom 8:26-27). Turn to your Christian friends for encouragement, support, prayer and reassurance. Ask them to help you, to add their prayers to your prayers, to pray for you when you can’t pray yourself – something we tend to neglect far too often fearing that others may think us to be faithless and weak. Pray looking at the cross; pray remembering the intense, never ending love that your Saviour has for you. When fear is near, God is even nearer.